What kind of options are there for a light 1.25in spinner on the Big Mig .061? The Cox spinner would be nice but the threads are different of course. It's a bit smaller, 3/4" maybe, but Dubro makes a real nice spinner for the Norvel. 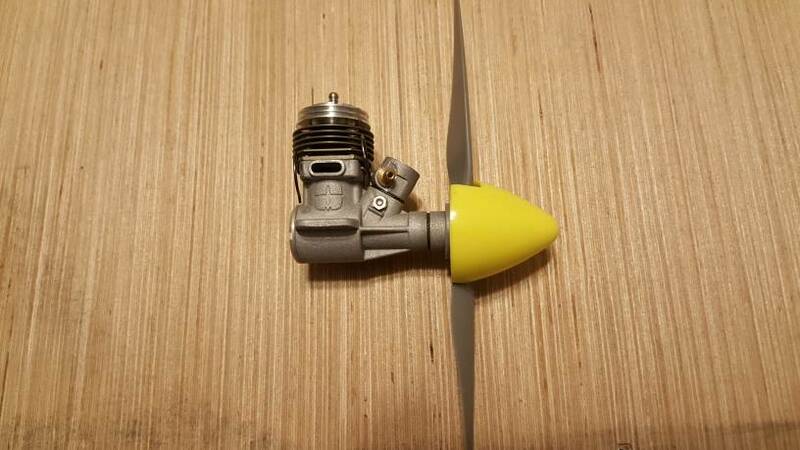 It's solid machined aluminum and mounts with the prop screw like the Cox ones. Jim Lee makes a nice aluminum spinner with backplate too, 1" as I recall. You'll have to do your own prop cutouts on that one though. He can be found in the Vendors Corner here on the forum under Lee Machine Shop. As far as I know, the Norvel smalls (.049/.061) use a 3mm prop screw. Mine are buried in the hobby closet right now. Can you confirm this? 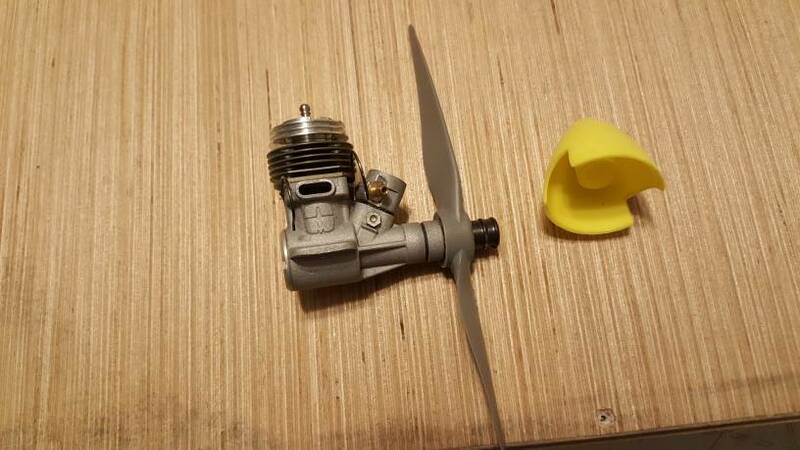 Really, your current/best/lightest option is to take the Cox hub to your favorite machinist buddy and have him replicate the hub, but drill the center out for the 3mm prop shaft. Note I didn't say cheapest. Cross-referencing a drill/tap chart shows #5-40 screw holes take a #38 drill bit, 3mm takes a #39 bit. If you have a Cox prop hub, and have access to a lathe or drill press, then use the 5-40 tap to line up/mount the hub with respect to the chuck. Switch to the tap required for the 3mm prop screw, and run it through, turning the chuck by hand. I recommend NOT free-handing this one because the metric tap will want to follow the imperial thread for a few turns, and this will cause the tap to wander off center/angled. You won't have much meat on the threads either, because they will be basically cut into the #5-40 threads. I also like .061 engines, and have a small smattering of the APs. They have a 4mm prop screw. I purchased a drill bit and tap to make a Cox spinner hub fit the 4mm thread. I doubt I left much of the #5 threads, and the tap cleaned out what was left while creating decent, usable threads in the body of the hub...that's how close the clean-out cut was! If you can dig the Norvel crank out of the block, and drill/tap for the AP/Norvel .074 prop screw, then you would be essentially doing what I did to the AP. Bit that is twice the work. Oh, and I really like having the bigger spinner in place. It sure beats looking at the puny spinner that came on the engine! The Dubro spinner is nice, but it is heavy too! I posted a question at CoxEngineForums regarding "our needs." Maybe you can help by showing just how we have been trivialized by the shrinking engine market (was that a pun, or a double-entendre?). Maybe the idea will crash and burn like so many of my models. You are making it the hard way! Just drill or ream out the hole in a Cox hub to just pass the 3mm screw and screw it in place. No threads needed. 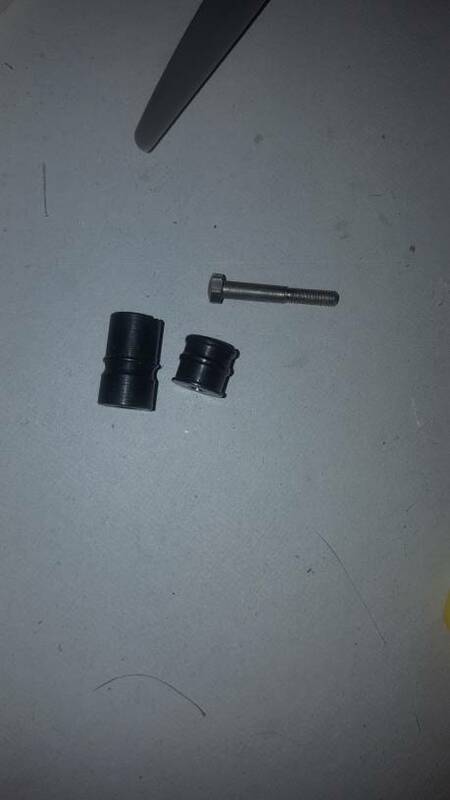 I tried removing the 3mm shaft from my little Norvels. Apparently I'm not trying hard enough! Doh...bad memory! Don't most/all Norvels come with a screw that threads into the prop drive/crank? That is how mine are. If yours have a shaft installed like the bigger engines then that must be a modification and someone glued in a stud. I would think that a soldering gun on the stud would allow that to be extracted? Which is larger diameter, 3mm or 5-40? I would think the 5-40 is bigger than the 3mm, but maybe the valleys of 5-40 are smaller than the peaks on the 3mm? That must be the case, or LR wouldn't suggest this method, eh? 3mm is bigger by only a few thousanths. That's why LR's suggestion works...and why his experience is still very relevant. Thanks Mr. Larry! For everybody else, I had a Senior moment...or a CRS moment. The Norvels, both large and small, do have a removable prop screw just as LR mentions! My "Big Ones" (Big Mig .074") are reliably buried under 2".spinners, so those prop screws don't get to see much day light. However, I will say that the same "drill it out" may be required for the Norvel .074. I will check tonight IF the head of the 4mm prop-screw will fit INSIDE the Cox hub. I sure hope so...I like the additional spinner option for the "Big Ones!" I have two Norvel .061s, but they are not in use beyond the initial bench time to ensure the "purchased-used" products worked. I feel they are valuable enough that when I had a chance to use the APs for less, I stocked-up on APs and switched them to my primary engines. I'd rather crash and burn an AP, than destroy a Norvel. Conversely, the prop studs on my AP .061s and AP .09 are hard-fixed on the crankshaft. While I'm sure they can be removed, I'd personally prefer to wear out threads in a more easily obtainable hub than a harder to get chinese crank. I use my AP .061s regularly. So that's how it got buried in my head that the Norvels are equipped with prop studs! So, basically, I injected thoughts out of line with the OPs question, based on memories that have been mixed-up with engine selection changes over the last two years. Please forgive my thread delrailment.. Thanks! Do you go to Brodaks Chris? No sir, that is a bit too far for me now. I'm still working to support my ex wife and not yet retired. I'll be watching the posts though. If i get a wild hair, i might try to make it to VSC this year as an observer. Probably have to fly in and out due to my work schedule. I thought the same thing, should take all of about one minute. For those of you that may actually want to do this the 1 1/4 spinner and hub set from cox international is going to take you much longer than a minute to adapt. 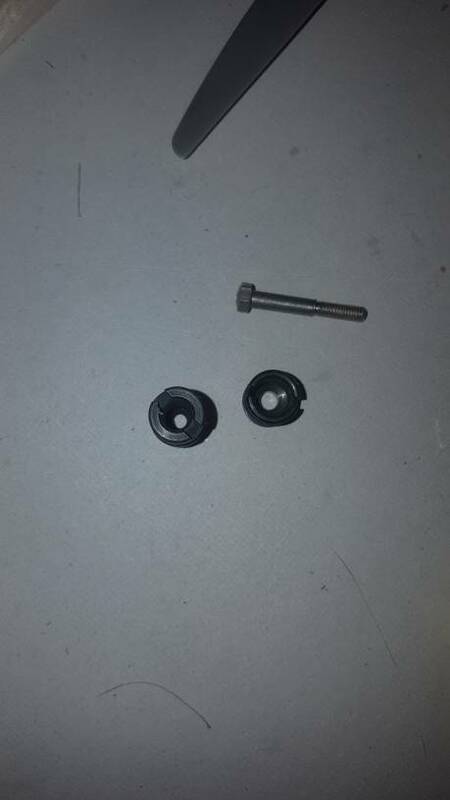 The hub is too long to accept the original Norvel prop screw. The counter bore in the cox hub is too small to fit the head of the prop screw, or any longer 3mm cap screw you may buy to solve that problem. So you better have a lathe. But if you buy the short "hub stud" from cox then the original Norvel prop screw will fit in length and inside the hub counter bore. Just a heads up. Thanks Chris for posting pics!